The 1932 Winter Olympics, officially known as the III Olympic Winter Games, were a winter multi-sport event in the United States, held in Lake Placid, New York. The games opened on February 4 and closed on February 15. 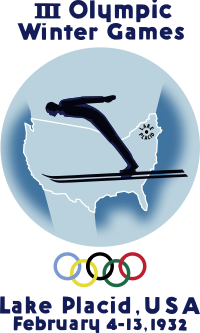 It was the first of four Winter Olympics held in the United States; Lake Placid hosted again in 1980. The games were awarded to Lake Placid in part by the efforts of Godfrey Dewey, head of the Lake Placid Club and son of Melvil Dewey, inventor of the Dewey Decimal System. California also had a bid for the 1932 Winter Games. William May Garland, president of the California X Olympiad Association, wanted the games to take place in Wrightwood and Big Pines, California. The world's largest ski jump at the time was constructed in Big Pines for the event, but the games were ultimately awarded to Lake Placid. The Games were opened by Franklin D. Roosevelt, then the Governor of New York. He would be elected President of the United States nine months later. Sonja Henie won the second of three consecutive Olympic gold medals in figure skating. She also won gold in 1928 and 1936. Irving Jaffee won the 5,000 m (3.1 mi) and the 10,000 m (6.2 mi) speedskating gold medals, beating previous champion and world record holder Ivar Ballangrud in the 10,000 m by 4.5 m (15 ft). Eddie Eagan became the only Olympian to win gold medals at both the summer and winter games in different sports. He won gold in boxing in the 1920 Antwerp summer games and gold in bobsleigh at Lake Placid. The bobsleigh race was held two days after the games' closing ceremonies due to unseasonably warm weather in the region the week prior. The Games also included events in three demonstration sports. ^ Lund, Morten (January 21, 2014). "How the Olympics Came to a Sleepy Adirondack Village". International Skiing History Association. Retrieved March 19, 2017. ^ Strege, Dave (August 21, 2013). "Mountain High makeover". Orange County Register. Retrieved August 17, 2016. ^ 1932 Winter Olympics official report. Archived April 10, 2008, at the Wayback Machine pp. 141-4. Accessed 12 October 2010. ^ 1932 Winter Olympics official report. Archived April 10, 2008, at the Wayback Machine pp. 145-6, 199. Accessed 12 October 2010. ^ 1932 Winter Olympic Games official report. Archived April 10, 2008, at the Wayback Machine pp. 30, 39-41, 50-1, 141, 157-66. Accessed 12 October 2010. ^ 1932 Winter Olympics official report. Archived April 10, 2008, at the Wayback Machine pp. 141, 150-57. Accessed 12 October 2010. ^ 1932 Winter Olympics official report. Archived April 10, 2008, at the Wayback Machine pp. 141, 147-50. Accessed 12 October 2010. Wikimedia Commons has media related to 1932 Winter Olympics. "Lake Placid 1932". Olympic.org. International Olympic Committee. "Results and Medalists — 1932 Winter Olympics". Olympic.org. International Olympic Committee. III Olympic Winter Games Lake Placid 1932, 1932 The official report.